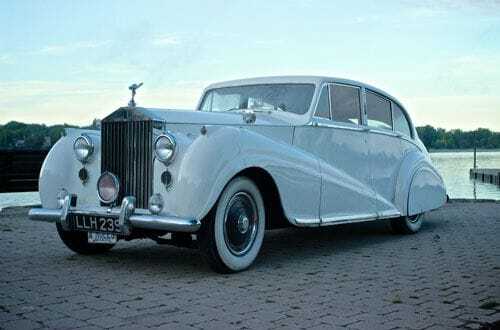 Take a ride back in time with this elegant vintage Rolls Royce. This Park Ward coach-built saloon style classic car is right-hand drive and has air conditioning. This Rolls Royce rental seats 4 passengers plus driver--three in the back and one in the front. The rear seating area has pull-down picnic trays and extra leg room, ensuring all passengers can sit comfortably in the back. The 1951 Silver Wraith Rolls Royce's last owners were Scott Abbot and Chris Haney, the inventors of Trivial Pursuit. The authenticity of this car is no game and this vintage Rolls Royce is one of 124 in the world. Contact us to make this elegant vehicle a part of your wedding or special occasion today!